At Advanced Dental Care, Dr. Jorgenson and his team know that you may not exactly be happy to hear us say the words “you have a cavity.” The good news is that today, you restorative dentist Dr. Jorgenson can repair a cavity and replenish your tooth’s healthy form and function with a composite filling that is tooth-colored. A cavity is caused by tooth decay, also called dental caries. Decay begins when the bacteria in your mouth feed on the sugars in the food you eat. As the bacteria feed, they excrete acids that attack the surface of a tooth. With time, these acids destroy tooth enamel and a cavity develops. Unfortunately, tooth decay is the most prevalent chronic disease in both children and adults. According to the National Institute of Dental and Craniofacial Research, 42% of children ages two to 11 have dental caries in their primary teeth, 59% of adolescents ages 12 to 19 have decay in permanent teeth, 92% of adults ages 20 to 64 have cavities in their permanent teeth, and 93% of seniors ages 65 and older have dental caries. 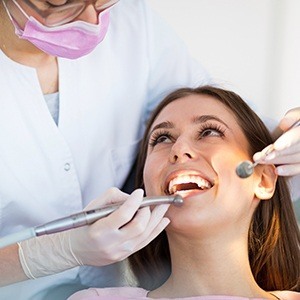 Why Choose Advanced Dental Care for Composite Fillings? In years past, cavities were always filled with an amalgam filling. Made of a variety of metal including silver, these were sturdy, but they presented problems. They were quite noticeable in your mouth, some people experienced metal sensitivity, and there were also concerns about possible mercury toxicity with metal fillings. A composite filling eliminates these problems and offers a number of advantages. The leading advantage of a composite filling is that the color of the composite chosen to repair a cavity can be matched closely to the existing color of your tooth. This is particularly advantageous if the tooth in need of repair is near the front of your smile or in a visible part of your mouth. In addition, a composite filling requires less tooth preparation. For the patient that means less time having your tooth drilled, and for Dr. Jorgenson, that means more of your tooth’s original structure remains after preparation. By retaining more of your tooth’s original structure, your tooth is ultimately stronger. Moreover, a composite filling chemically bonds to the tooth structure, thereby providing greater support. Do you want to know if a composite filling is the right choice to repair a cavity for you? Call our Costa Mesa dental office to reserve an appointment with Dr. Jorgenson. We are happy to serve patients from Irvine, Newport Beach, Huntington Beach, and beyond.